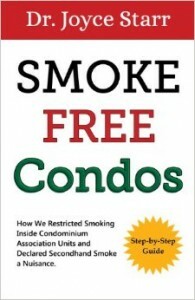 “I previously worked for the American Lung Association under a health initiative designed to provide free assistance and consultation to management companies, condo owners, and condo boards on the benefits of restricting smoking inside the unit. While adult smoking is by far the minority, and nothing hurts the resale value of condo more than tobacco smoke, when it comes to a community or association restricting smoking inside all the units, great difficulties amount. “Starr’s book includes an interesting overview of case law that seems to favor the nonsmoker and points to the conclusion that there are no legally protected rights to smoke. While smoking is certainly not illegal, it also is not a right in the sense that there are laws protecting a person’s right to smoke. It can best considered as a privilege, much like driving, and like driving, it can be suspended or controlled if abused. The book also includes a copy of governing doc language and other tidbits that a board may find useful. For $15, this book can easily save an association thousands of dollars in attorney fees. “I wish to add something further…in Dr. Starr’s case, changing the condo governing docs was a much harder task because unlike other states, Florida COA law requires a 67% consensus from all the condo owners. Not a simple majority of the voters, but 67% of all condo owners must vote in favor of an amendment in order for a change to take effect. Despite this setback, Dr. Starr got it done. Read this book and you will find out how to do it just as successfully. For those in the public health community that are considering this book as a resource, I highly recommend it. This book, along with her other magnificent work – Secondhand Smoke Crimes – should be in your library. In fact, contact Dr. Starr directly via her personal website for bulk orders. I have found that by providing this book to associations in advance of board presentations changes the dynamics of the meeting. For instance, questions become inquiries for more knowledge instead of accusations.” – Matthew C.